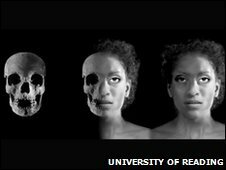 Archaeologists have revealed the remains of what they say was a “high status” woman of African origin who lived in York during Roman times. Academics say the discovery goes against the common assumption that all Africans in Roman Britain were low status male slaves. 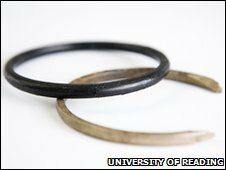 Remains of the Ivory Bangle Lady, as she has been named, were studied in Reading using forensic techniques. She was first discovered in the Bootham area of York in August 1901. Her remains were in a stone coffin near Sycamore Terrace in the city. Her grave dates back to the second half of the 4th Century. She was buried with items including jet and elephant ivory bracelets, earrings, beads and a blue glass jug. She also had a rectangular piece of bone, which is thought to have originally been mounted in a wooden box, which was carved to read, “Hail, sister, may you live in God’. The grave goods and skeletal remains of the Ivory Bangle Lady were studied by the archaeology department of the University of Reading. The university’s Dr Hella Eckardt said a study of the skull’s size and facial features along with analysis of the chemical signature of the food and drink she had consumed led to their conclusion that she was of high status and of African origin. Dr Eckardt said: “Multi-cultural Britain is not just a phenomenon of more modern times. The Ivory Bangle Lady will feature in an exhibition about the diversity of the population of Roman York at the Yorkshire Museum in August.